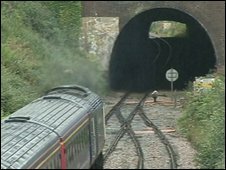 It has been a bit low key in the media but news that the 12.5 miles of singled track between Kemble and Swindon on the Golden Valley line is to be redoubled at a cost of £45 million is very welcome indeed and it restores one of the madder bits of cost cutting that was enacted in the 1960s by a beleaguered British Rail Board. Together with the redoubling of the North Cotswold line, it represents a good infrastructure investment for the rural Cotswolds as a whole, where the economy is dipping badly and jobs are few. In those dark years of the late 1960s and 1970s, supporting railways was such anathema to politicians that Sir Richard Marsh, head of BR at the time, once commented exasperatedly that something horrible must have happened to them in a third class compartment when they were small (or words to that effect…). Today, it is a different story. Rail is essential again as passenger figures match those of the 1920s and, in a major political turnaround, it is supported strongly even by local MPs such as Conservative Geoffrey Clifton- Brown who seem to have learnt that railway investment is (as we always said it was) vital to economic development in rural areas like Gloucestershire. It’s taken a long, long time and staff who worked for BR in those grim days of the late 1960′s when Rail had no friends in either political party must be allowing themselves a wry smile at the turn around. I wonder if the new converts to rail transport would also like to support the reinstatement of Stratford-on-Avon to Honeybourne on the north side of the N. Cotswold line and, indeed, the heritage GWSR’s aim to reach Honeybourne from the south. While they are at it, maybe they could fund Cheltenham Racecourse through to an interchange station at Cheltenham. Steam train to Cheltenham Parkway, anyone? The GWR is getting greater again every day!